The first two rounds of Freakhouse giveaways have come to an end. 5 copies will be spread out from Portugal to Russia, and another 5 copies are flying all around Australia. I'm kind of sad about that last one. I know that New Zealand is smaller and thus probably didn't compare in the number of entries for the giveaway, but I was hoping at least one book would fly that way. I really wish that I had the power to spy on the entry details, not to look at the people, just to see where the entries are coming from. For all I know, there may have only been 2 entries from New Zealand. I just thought that the odds would improve if I narrowed it down unlike the worldwide giveaway that I did for Galen. In any case, I hope that the winners will enjoy their new books. I have confirmation that Galen reached most of their destinations. Unfortunately, there was one book that will not be received by the winner. It involved many back and forths with UPS, but even after all of the arrangements, it still ended up being returned. Now I have had my own issues with UPS myself, so I get that it isn't always a smooth process. They come out to deliver it 3 times and after that it's "return to sender". But like pretty much all couriers, if you call them, they can hold it. As long as you keep in contact with them, they're pretty good about making sure they can accommodate you. I guess that's why this return has me feeling a bit defeated. After sending it to the other side of the world, having it held at customs and then again at UPS, it just seems like the whole thing could have been avoided. If I had access to another nearby winner, I totally would have to redirected it and given it to someone else. Unfortunately I don't know anyone there, and I can't have them hold it for me to restart a giveaway. So it's a lost book. I am very grateful to the customer service team at CreateSpace and Goodreads for all of their help in this matter. As for my new set of winners for Freakhouse, everything is set to ship out to you! All but one book will be delivered by UPS (I don't have much say with that, I'm afraid, at least if you want to receive your copy before September 20th). If you're entering a giveaway, please be aware that a courier service can't deliver to a PO Box, so unfortunately, you will probably be the last to receive your book going the traditional standard shipping route. Also, holy hell, Australia! How is it that I can send a book to Russia for half the cost of sending it to you! Don't answer that, I already know that there's an added benefit to being attached to a continent that has rail access - options make everything cheaper. It's really only slightly more expensive than shipping within North America - not an island and yet has useless rail systems so you're either looking at 2 months delivery by truck or one week delivery for $30. I love my readers but not enough of you buy my books for me to afford spending $30 on each of you - especially with how many books I'm giving away this time! If you're in the UK or Ireland, you still have another week to enter for your Freakhouse giveaway (Come on, Ireland! Get in there! ), and Canada and US just opened up this week so there's 2 weeks to go for you. Yes, Canada and the US are separate because most of Goodreads is US, so it's the only way my fellow Canadians can stand a chance! I don't imagine that I'll be able to do another giveaway of this scale any time soon, so I really wanted to make this one count. In the meantime, I'm eagerly waiting to hear what people think of their new books! 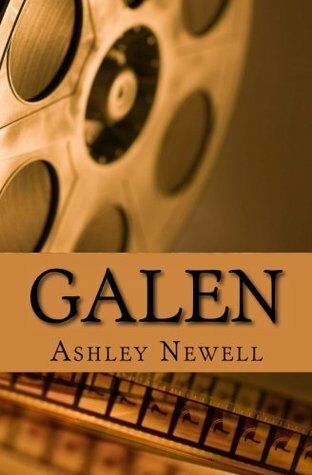 Galen is currently available online at Amazon (pick the country of your choice! ), Kindle and Kobo. Expect the same from Freakhouse starting August 26th. Freakhouse winners, I'm trying my best to see that your free books come in as advanced copies (before August 26th), but I'll be honest, some of them will be cutting it pretty close. And PO Box, yours won't be "advanced" anything, sorry. This is a summer of free books! There is still a week left to enter into the Freakhouse giveaway if you live in Australia or New Zealand. And starting this week (Friday, actually - yes, like right now! ), if you live in the UK or Ireland, your giveaway begins! Just a reminder, unlike how things went down for my Galen giveaway, I've broken things down regionally, giving you better odds to win. Each giveaway consists of 5 books, so based on where you are located, you might not actually have much competition. Last I looked at the AU/NZ giveaway, there's only about 50 people requesting so far - much better odds than the 900+ entries for Galen. So if you haven't entered yet, get on it! And if you are from Canada or the US, never fear, your turn is coming (separately!). Stay tuned to find out when your giveaway begins! ​Best of luck to all you readers out there! Giveaway ends August 05, 2016. 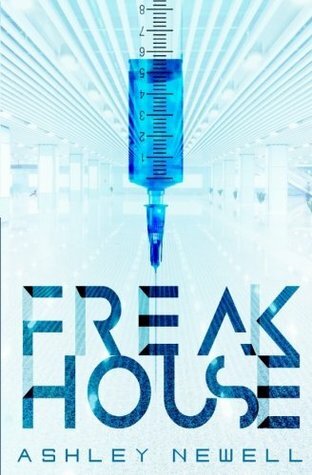 ​Freakhouse is all brand-spanking new with a beautiful cover designed by the lovely Rebecca Frank! She made a variety of cover art designs for me, and she took things in a direction that I didn't even know I wanted! Freakhouse could have had a very different look to it, but there was just something unexpectedly stunning in the vibrant blues and whites of this little number that I just couldn't shake after seeing. Rebecca Frank nailed Dystopia in all of the designed she made for me, so if you're ever in the market, I highly recommend her services! I thought for sure that I'd be going back and forth for weeks, never being 100% happy (not because of her, just because I'd be that picky), but she seemed to know exactly what would be best. Trust me, I questioned her once and was sent a whole wack of alternatives; I replied back that night saying that she was right the first time. And because I'm Canadian, it had to be followed-up with a "sorry"! Now, if you've been following along, you'll know that I know the Galen giveaway promotion was a little rough going. I'm not ashamed that I had to re-learn, and thankfully I anticipated just as much so I've got the benefit of being able to do one after the other! Freakhouse giveaways are on the horizon - in fact, one round will being tomorrow! Clearly 4 books opened up worldwide doesn't exactly put the odds into your favour. So this time things will be different! 5 books will be sent out in a variety of rounds. USA will have its own giveaway. Canada will have its own giveaway. UK and Ireland will combine as one giveaway. Australia and New Zealand will combine as one giveaway. And then all the rest will have their own without these big fish in the way! Stay tuned for when the giveaway in your area opens up! As promised, more fun things to come! Didn't win a free book? That's okay! Enter this "Name That Title" for a chance to win a coupon to the store that opens Friday. You have until Friday, July 15th to submit your guess! Like last time, all you have to do is "Name That Title"! "But I just stumbled onto this blog post and I have no idea who you are or what you write!!" you exclaim? Never fear! If you want to drastically improve your odds of guessing correctly, just click the link "All Works". There are no trick questions. The answer will have to be a book that I have actually written. Although, if you want to test your psychic powers and just go with your gut, by all means, feel free. There's no contest entry fee or penalty for wrong guesses. I will, however, only take the first answer submitted by each email address. Why do I need your email address? Because that's how I will send the coupon code to you, and only the coupon code. Please ensure that you include a valid email address so that you can receive your prize. No re-draws or rainchecks. Name That Title - Round 2! The Galen giveaway has ended, and while no penguins will be receiving a free copy (yet! ), Galen is truly off to see the world. While I did have the contest opened up globally, I'm still in awe of how global the results actually were. You see, when I last did a giveaway - however many years ago - Goodreads was very heavily American. And while there were still a large amount of American entries, there was representation from far more countries than I remember seeing previously. And then there's the winners. Had I run this same giveaway a few years ago, guaranteed that 3 out of the 4 books would have being on their way to the USA right now. Today, while one copy is headed south of the border, the other three are off on a pretty big adventure! Galen will soon be calling Portugal, Belgium, and the Ukraine home. ​Travel safely my little ones, and bring happiness to your new families! Remember, if you are interested in bringing Galen home to your family, the online stores will be open July 15th. Almost there! ​Stay tuned for more fun! As promised, the giveaway has begun. No strings attached (other than a Goodreads account). This is the soonest that you will be able to get your hands on the new edition of Galen. The online store will open up on July 15th if you're eager to buy a copy; better yet, mark your calendar to visit your local library and request a copy, that way everyone has access to a free book! Best of luck to you, contest entrants!